As my printer purchase hints I have to do more of printing lately and printing web pages is historically crappy experience. There is simply too much stuff you don’t need on paper and there isn’t always printer-friendly option (guilty myself). I remembered PrintWhatYouLike I tried briefly for my post on tools to improve readability of web pages and I often use PageZipper from same developers. PrintWhatYouLike is bookmarklet that allows you to modify web page in browser before you print it. When you invoke it it adds sidebar-like interface to the side of page and you can use controls on it, as well as click blocks on page and choose what to do with them. merge multiple web pages before printing. There are also some additional features that require registration, they are mostly about saving your settings (for example if you need to print often and a lot of information from same site). Other than printing you can save result as PDF. Web masters can embed bookmarklet into their pages with code snippet or WordPress plugin. I had encountered some minor formatting issues in Opera when sending page to print via button in sidebar. Easy fix is to close the sidebar (changes are retained until you close tab or navigate away) and use browser’s native print command. 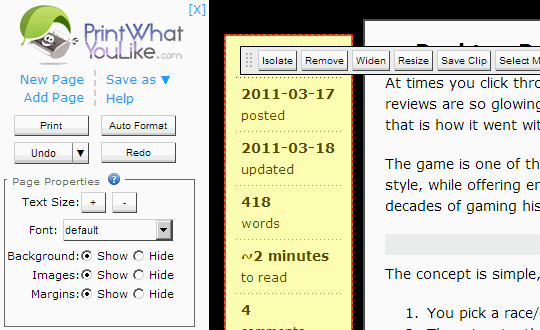 Exceptionally useful bookmarklet that easily gets nice printout even from very cluttered and complex pages. Wow great tool. This makes printing from webpages easily. Thanks for the tip.